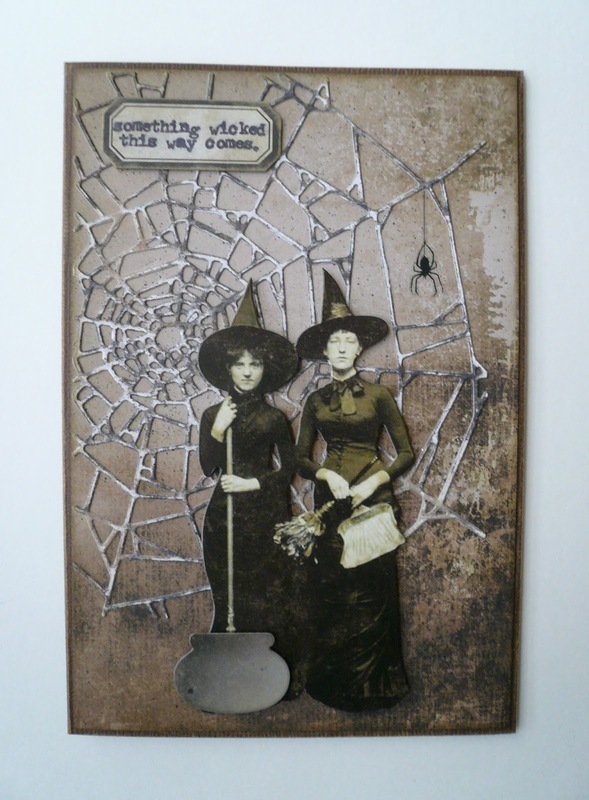 My Kinda Art: something wicked this way comes. Hello and welcome! I've been playing with new stuff from Tim Holtz for Halloween 2017 again. On today's card I used the new Cobweb Die, Mini Halloween Things Dies, Halloween Remnant Rubs and Ancestors Paper Dolls. I gotta say I love the witches. So much so I bought another pack, you can never have too many Paper Dolls! I've uploaded this card to the Simon Says Stamp Monday Challenge Blog. This weeks theme is "A Walk On The Dark Side" and the designers are showcasing Tim Holtz Products. Go check it out. Thanks for stopping by! This is a really stunning card! I thought it was so clever of you to make the spiderweb look silvery-white-gray. It has a lot of depth and really shows your skills for turning a standard die shape into something full of life and originality. This turned out beautifully and I'm so glad you shared it with us for this week's Simon Says Stamp Monday Challenge!